One of my favorite little Kate things, is the fact that she doesn't wear her engagement ring all the time. I love my 200 year old family heirloom that I wear, but to be honest, it makes me nervous. So like Kate, I have my backup. Instead Kate has a lovely welsh gold band, which expanded to 2 when little George was born. 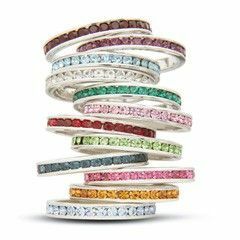 This has brought on one of my favorite trends, stackable rings. Have a great Repli-kate Day!